Financial experts claim that 82 – 90% of small business failures are caused by poor cash flow. Many profitable companies find that they are insolvent because of uneven cash flow. In other words, not enough cash is coming into the business in time to meet expenses. It is therefore essential that companies carefully manage cash flow, particularly if they operate in rapid-growth or seasonal industries. Cash flow is the movement of money into and out of your business. Cash inflow comes from operations such as the sale of goods and services, financing, or the sale of assets. Cash outflow occurs during operations such as purchasing materials and equipment, meeting payroll, paying rent, insurance, and other business expenses; and making loan payments. It is important to balance the inflow and outflow of cash so you do not have to rely on a loan or line of credit to meet your monthly expenses. A cash flow analysis can help you understand how and when money moves into and out of your business. It involves taking a close look at accounts receivable, inventory, accounts payable, and credit terms. By analyzing each of these areas, you can identify issues and take corrective action to improve cash flow. This can include everything from increasing collection activities to offering better terms for paying early, charging late fees, managing material costs and productivity, renegotiating the terms of leases and loan agreements, refinancing mortgages on buildings you may own and leasing equipment. Operating activities: Cash ﬂow from operating activities shows if your day-to-day operations generate or deplete cash. If net cash ﬂow from operations is negative, it means that you are spending more cash than you are generating in producing and selling goods and services. If it is positive, you are generating more cash than you are spending on day-to-day operations. Investment activities: Cash ﬂow from investing activities measures your investment in the company. Long-term expenditures and other investments are taken into consideration. These expenditures are intended to produce proﬁts in the future. Financing activities: Cash ﬂow from ﬁnancing activities includes three main transactions: stock transactions, debt transactions and dividends. Trends will be identified and examined on how your company is financed and its impact on cash flow. Financial ratios that focus on cash flow and liquidity will also be analyzed to determine how sustainable your company is at a given point in time. These include the operating cash flow ratio, price to cash flow ratio, cash flow margin ratio, debt to total assets ratio, current ratio, and quick ratio. The ultimate goal of a cash flow analysis it to get to a position of excess cash flow so your company can operate in a strategic and proactive manner, rather than being reactive and defensive. If cash flow is a problem for you, contact your LaPorte Accounting Services advisor. 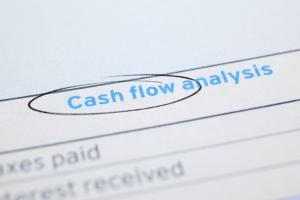 Conducting a cash flow analysis can save your business.